GANGNEUNG, South Korea — As South Korea's national soccer coach prepared to play Japan in a 1954 World Cup qualifier, President Syngman Rhee, who'd been liberated, with the rest of Korea, from Japan's brutal colonial rule in 1945, had some advice should the Koreans lose: "Don't think about coming back alive," he supposedly told the coach. "Just throw yourself into the Genkai Sea." There are sports rivalries, and then there's Korea vs. Japan — an often toxic mix of violent history and politics, with a (un)healthy dose of cultural chauvinism and envy mixed in. 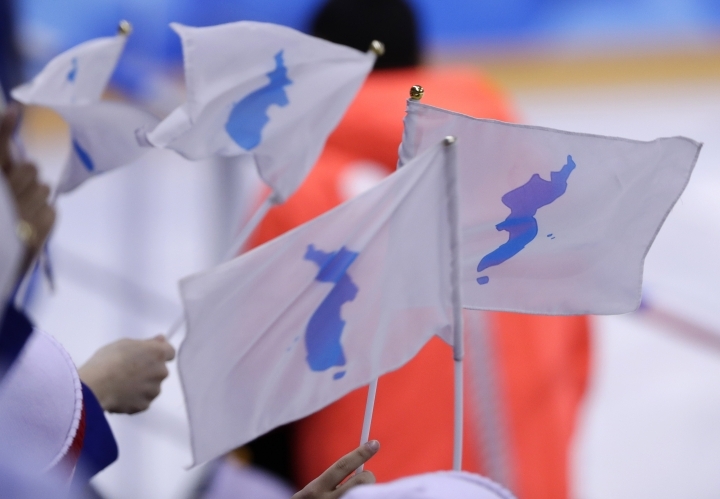 The fierce grudges over historical persecution and a thousand perceived national and cultural slights cannot be untwined from the sports for many Koreans. 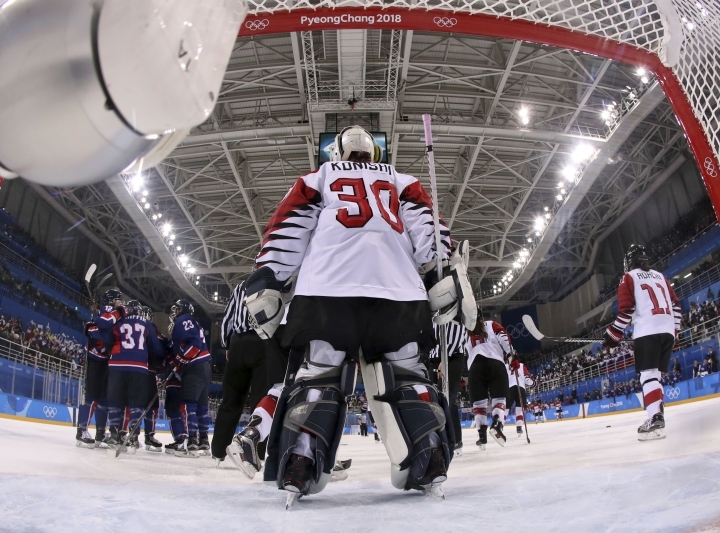 These swirling emotions were front and center Wednesday as a combined team of North and South Koreans played regional power Japan in women's hockey. Both had yet to win a game these Olympics. Both desperately wanted that win to come against their rival. But Japan pulled it out in the end, defeating the joint Korean team 4-1. 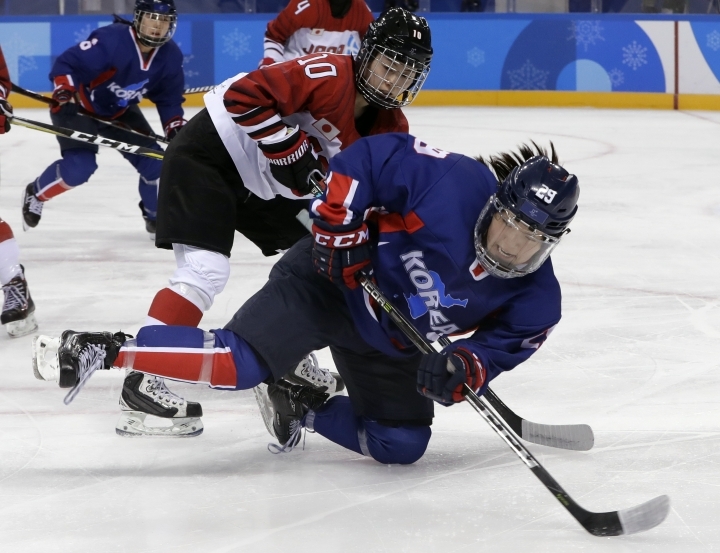 "We did our best," South Korean forward Park Jong-ah said after South Korean fans showered her team with stuffed animals in the moments after the loss. The two Koreas share much, not least language and culture, but they've also been divided for seven decades and are still in a technical state of war. Just weeks ago, there were real fears of military conflict here. 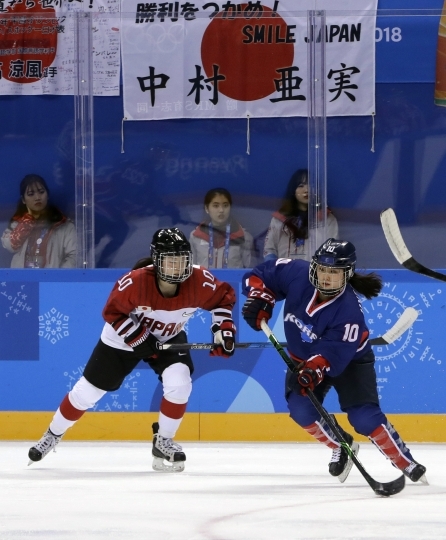 More than any temporary cooperation on the hockey ice, then, it may be their shared hatred of Japan — and the near universal perception that Tokyo has never fully apologized for or acknowledged its colonial evils — that joins them most forcefully. The last time the Koreas were unified, in fact, was during Japanese rule from 1910 to 1945. The end of WWII saw the division of the peninsula into a U.S.-backed south and Soviet-backed north. In the South, this history can sometimes feel fresh. 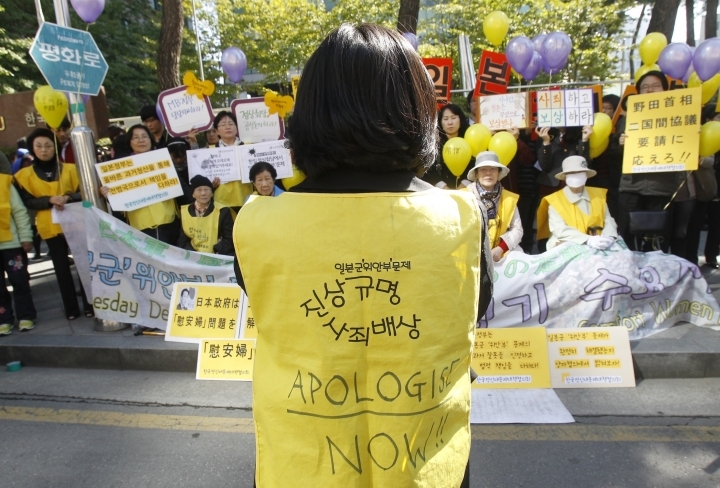 Weekly demonstrations have gone on for more than two decades in front of the Japanese Embassy in Seoul by an ever-dwindling number of the thousands of Korean women forced into sexual slavery by the Japanese military during the colonial era. Koreans also like to raise the debt Japan owes mainland Asia (Korea and China) for the large elements of religion, culture and language it borrowed during its formative centuries. All but forgotten in Japan, there are angry memories still here about a hill of sliced-off Korean noses collected during a 16th-century Japanese invasion of the peninsula. 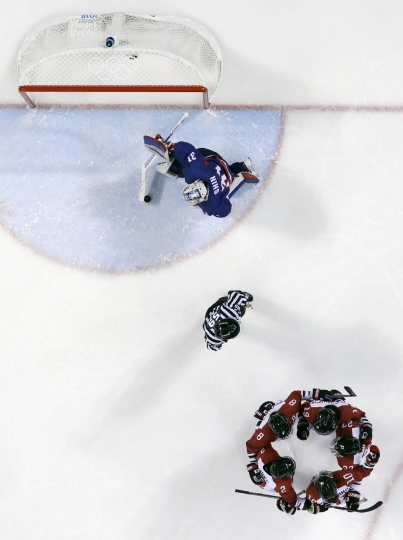 All this and more was in the air as these two hockey teams met. 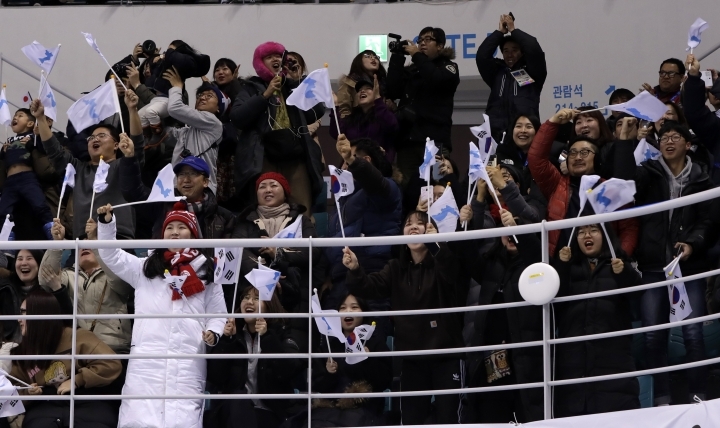 "I felt a big thrill when the unified team entered the rink," said Yu Yongsin, 36, a schoolteacher from Daejeon in central South Korea. "When they scored their first goal, my happiness reached its zenith and it was the best and the most touching moment." In the arena Wednesday, South Korean cheerleaders in yellow miniskirts bounced to K-pop while visiting North Korean cheerleaders sat in matching red jumpsuits. Fans waved flags that showed a single united Korean Peninsula or the South Korean national flag. Small groups of South Koreans attempted more chaotic, improvised versions of the North Koreans' meticulously choreographed cheering routines — efforts that would occasionally dissolve into giggles. There was even a lookalike of Kim Jong Un, North Korea's dictator, wandering around for a while. 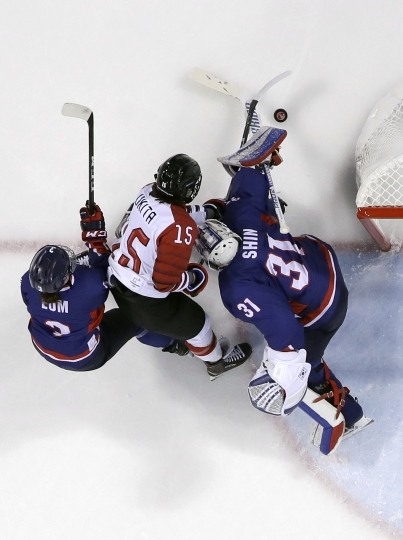 The Koreans scored their first Olympic goal at 9:31 of the second on their 33rd shot over three games. Randi Heesoo Griffin from Cary, North Carolina, whose mother is South Korean, scored from the right circle off an assist from fellow American Marissa Brandt before the Koreans came together jumping and celebrating on the ice. Later, Griffin would call the goal "kind of a lucky bounce." "I know in reality the unification is difficult at this moment, but I strongly felt we were one at that moment," said spectator Lee Jung-woo, 47, from Incheon, just west of Seoul. Many in Japan and South Korea watched with unease as the North Korean leader and U.S. President Donald Trump traded threats of war over the last year amid a near-constant barrage of weapons testing by the North, which is approaching its goal of an arsenal of nuclear missiles that can reliably target U.S. cities. Japanese officials have expressed concern during the games at Kim Jong Un's sister flying south with an invitation to talk, which South Korean President Moon Jae-in is considering. Past conciliatory moves by the Koreas have only allowed North Korea breathing room so it could continue its weapons programs, Defense Minister Itsunori Onodera said this month, according to the Asahi Shimbun. Abe also warned Moon not to fall for North Korea's "smile diplomacy" because the North remains committed to nuclear weapons. The Korean team has had some tough games. It lost 8-0 to Switzerland on Saturday, then 8-0 to Sweden on Monday. After that game, Korean players had vowed redemption in their last preliminary round match against Japan. "After the decision was made to combine the teams we didn't see north or south. We just became one team ... we made the best of a tough situation," said Sarah Murray, the combined Korean team's Canadian coach. "We are still hungry for our win," Murray said. "We are still going to play to win for the last two games. " Sunwoo Yoo, a 44-year-old South Korean spectator watching the game Wednesday, has studied overseas and has many Japanese friends. Yoo had a more subtle take on the proceedings. "I put more meaning on a unified Korean team, rather than a win or a loss," Yoo said. "It's good for our team to win and I'll root for our country in my heart, but I don't want to do it so openly. I just like this heated atmosphere." Foster Klug is South Korea bureau chief for The Associated Press and has covered Asia since 2005. Follow him on Twitter at @apklug. Follow Kim Tong-hyung on Twitter at @KimTongHyung. AP correspondent Hyung-jin Kim contributed to this story. This story has been corrected to show the name of the schoolteacher in the 12th paragraph is Yu Yongsin, not Yu Wongsin.